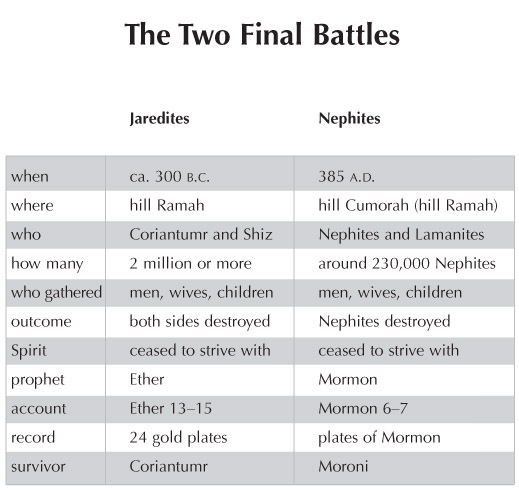 This chart compares the final battles of both the Jaredite and Nephite civilizations, which took place near the same hill (see Ether 15:11). Moroni, the only known Nephite survivor of the battle at Cumorah, was the narrator of the account in the book of Ether that involves the final Jaredite battle at Ramah. He must have been deeply impressed by the parallels between the two wars of annihilation. In both cases, nations of great promise were wiped away. Because of their wickedness, the Spirit of God "ceased to strive" with both peoples (Mormon 5:16; Ether 15:19). In this chart the dates, places, numbers of soldiers, outcomes, and other statistics of these battles are contrasted. Despite the consequent collapse of these civilizations, a remnant of Lehi's seed was preserved, fulfilling the promises made by the Lord to Lehi, Nephi, Enos, and other righteous Nephites.